Can you imagine a house without windows? Such a horror it would be! Windows ensure that your home is always bright and ventilated. But that’s not all. They can also contribute a great deal to the aesthetics of your abode. Dress Up Those Windows Right! Here’s what you could use to up the style quotient of your home by dressing up your windows! 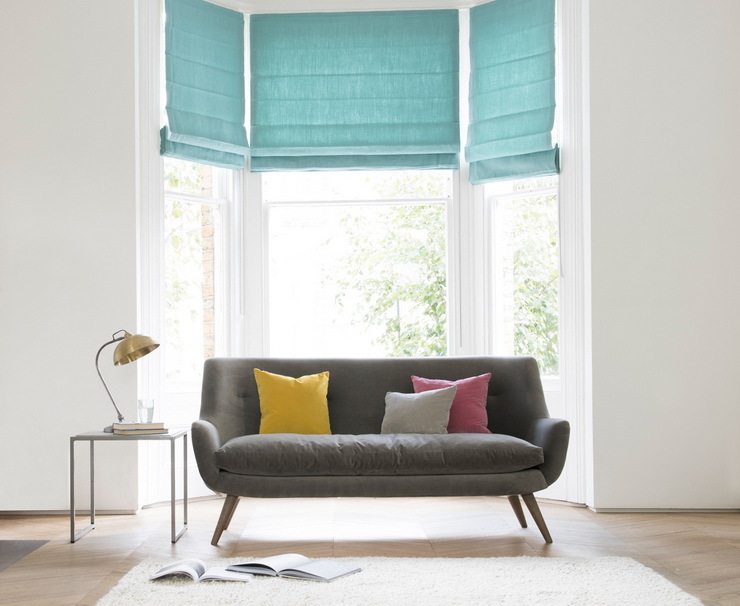 For a simple yet stylish solution, go for roll-up varieties and Roman blinds. Choose blind fabrics that you can coordinate with other accessories and upholstered furniture. You may go with real or faux silk for a luxe feel or a crisp linen in a cream shade for a traditional look. Opt for lighter shades to let the natural light come in. Roll-up blinds are easy to hang. And, to prevent the room from getting too hot you can always tie them at different heights according to your requirements. For a vintage-inspired interior, go for sheer panel curtains that make a pretty choice instead of French door blinds and curtains that can be difficult to pick. Fabric panels and bold floral prints are combined to produce beautiful sheer curtains that let the natural light come through. Hang these stunning curtains for a country feel using a narrow pole and small rings to match. Team them with neutral blinds for privacy. The half curtain or a cafe curtain is the perfect choice for a kitchen window. Choose a pretty food theme based print in voile fabric that goes well with your kitchen theme. This stylish window dressing will provide a little privacy to your kitchen window and still let the natural light come in. Use cafe rods to hang the curtain on the window. For a stylish and elegant choice of window dressing, go with traditional shutters that are still hugely popular. You may choose from different styles like the half cafe design, full window shutters, and full solid shutters that are ideal for a cosy bedroom. Use waterproof vinyl shutters that are ideal for kitchens and bathrooms to prevent any damage to your purchase from water and humidity. And, crafted shutters made from medium density fibreboard are the best options if you want value for money. Paint your shutters in bold colours and add a style statement to your windows. Dress your windows with sheer curtains to allow natural light to come through (but not let the passersby peep in). Made from chiffon or voile fabric, these curtains are the best replacement for your traditional lace curtains. Use a narrow rod to fit the frame according to your requirements. Use curtains with subtle embroidery, that is a perfect match for your house. Opt for tab top curtains for a laid-back solution. They do not require any curtain rings or hooks. They are easy to use, so you may replace them with a new design whenever you fancy a change. 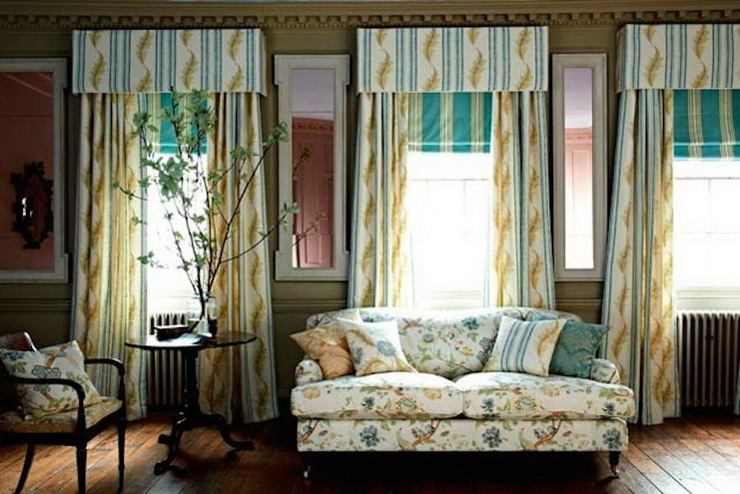 Choose lightweight or sheer fabrics in a subtle print to dress your large bay windows. And, voila! You couldn’t have asked for a better option. To bring out the best of these curtains, choose a pole that coordinates well with the colours of your windows and walls. For a simple yet smart finish that’s appealing to eyes, opt for soft waves of fabric to dress up your windows. With a wide tempo heading pleat, these curtains fall in soft and regular waves, and that always makes them look perfect. As you team them with a sleek modern suspension rail, the curtains will look neat open or closed while they sit beautifully on the floor. Opt for a cut-velvet pattern to add a luxurious edge to your windows. Make a smart move and choose double pole curtain designs. It gives you the freedom to hang both a sheer and a curtain. Use passing rings to draw the curtains all the way round in separate sections. For a real and neat effect, keep the curtains to floor-length and sheers to sill-length. And, to give a modern touch to this rare combination, pair a florally patterned voile with a bold and floral curtain fabric. 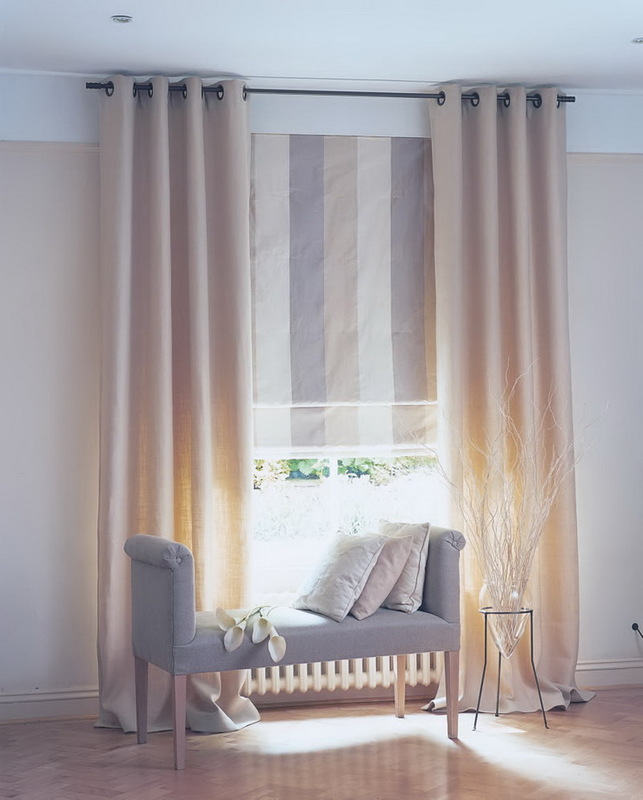 Give your windows a contemporary look using a flat pelmet layer over voile curtains. It covers up curtain poles and other fixings, and provides a neat finish to your windows. For a sophisticated hotel bedroom look, select pillows that match your pelmet. You may opt for fresh and neutral colours to add a modern touch to your room. Hang single curtains instead of pair curtains on large windows. It gives your room a laid-back yet contemporary look. Remove holdbacks and opt for a lightweight fabric that drapes beautifully for a relaxed feel. You may also use full-length curtains so as to let them pool on the floor and complete the look. Use small rings to secure the curtains tightly. Besides the above-mentioned tips, opting for blackout curtains is the best idea for your bedroom. It prevents extra light to come through and makes your room cosy. Opt for Venetian blinds when it comes to kitchens and bathrooms as they can be tilted to adjust the light, and are super easy to clean. If you need some extra privacy, team lighter voile curtains with blinds. Need advice from an expert? Get in touch with Hipcouch today! Newer PostAcrylic Vs. Laminate: Choose The Right Finish For Your Kitchen Cabinets! Older Post7 Stylish Headboard Ideas For Your Bedroom!